This isn’t the kind of sandwich your mom sent with you in a brown bag for lunch time. This is a crisp, sweet, creamy, sticky masterpiece; our rendition of a sandwich we first tasted at one of our favorite restaurants, the Gelato Company. It’s low budget, high flavor and is everything you could ask for on a spring or summer day. You might even whip out the old picnic basket. The ingredients listed will be vague amounts, as you can put as much or little on your sandwich as you want. I recommend trying neufchatel cheese as it’s 1/3 the fat of cream cheese and right next to it in the grocery store. It looks and tastes the same, but is creamier. We use it instead of cream cheese because we can’t tell the difference and it costs the same. Grab 2 slices of bread, and spread a generous layer of neufchatel cheese on one of them. Stack a layer of ham and then a layer of turkey on top of that. 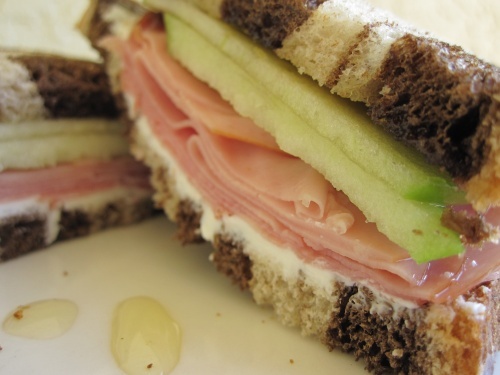 Thinly cut 3 or 4 apple slices per sandwich, and save the rest of the apple for the next time. Place on top of meat. Drizzle honey all over well…everything, and top with bread. Complicated, I know. Simple, cheap, and delicious! I think I’ll have one of these for lunch tomorrow! Thanks for the inspiration.